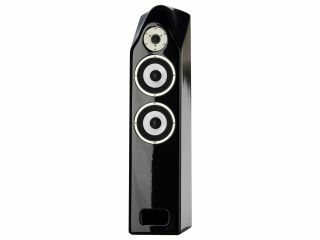 Hansen Audio has added a new floorstanding speaker - The Knight - to its King and Prince line-up. "The Knight is an elegant slim three way floor standing dispersion and phase coherent speaker, using the latest developments in drivers and enclosures. These technologies have also been used in the recently released and much acclaimed King and Prince V2 Loudspeakers," says the press release. "Both the 182mm woofer and mid-band driver are designed, engineered and manufactured by Hansen Audio themselves, to match perfectly with the high precision 25mm tweeter custom built for them. "These drivers all use a Hansen developed multi-layer composite sandwich cone mated to a powerful Hansen optimized geometry motor assembly, which incorporates sound wave deformation prevention technology. "Acoustically inert, the elegant enclosures are finished in a class 'A' high gloss lacquer. Whilst the enclosures themselves were developed using a number of new materials, Hansen Composite Matrix is an inert material made up of multi layers with each layer using up to six different components. "Hansen have now added a further internal layer to the enclosures construction called The Cloaking Device to further lowering the distortion floor, ensuring the enclosures are no longer part of the sonic equation. "The Knight also introduces the New V2 DAT (Driver Assimilation Technology) crossover. Having engineered, designed and built in house each driver to suit its application, Hansen can easily match through the crossover to the high performance tweeter, without the need to use the crossover as a fix. "Therefore the high grade component crossover can utilize point-to-point hand solder (silver) in a first order device. This also ensures that the sound is as pure as possible. Each driver is easily capable of operating more than two octaves beyond their crossover points both above and below. "This in turn has further lifted another veil in the sonic performance of these loudspeakers, producing improved timbre to the instruments and nuances across the musical spectrum, adding altogether a greater emotion to the musical performance. "These speakers are real evidence that the total design of loudspeakers has moved forward leaving the black art days of speaker creation behind for good."